Surely she meant it as a tool to keep me focused on academics and not talking in class. However, I've come to find that even as adults in the workforce, that policy creates a fine line between being viewed as a productive employee that is seen as stuck up and being a social employee that apparently doesn't work hard enough. It took me a while to understand that neither has to be true and that people are going to label you no matter what (especially considering that ironically, I’ve been labeled as both in the same exact company). What’s important is being happy with yourself and the work you do and being satisfied with the friendships that may come along with it. As women, it can be difficult to navigate friendships at work. Problems can arise from conflict. Sometimes work can be affected by drama from friendships at the workplace and in some unfortunate cases, women are pit against each other while their competitions is fuel to the amusement of others. 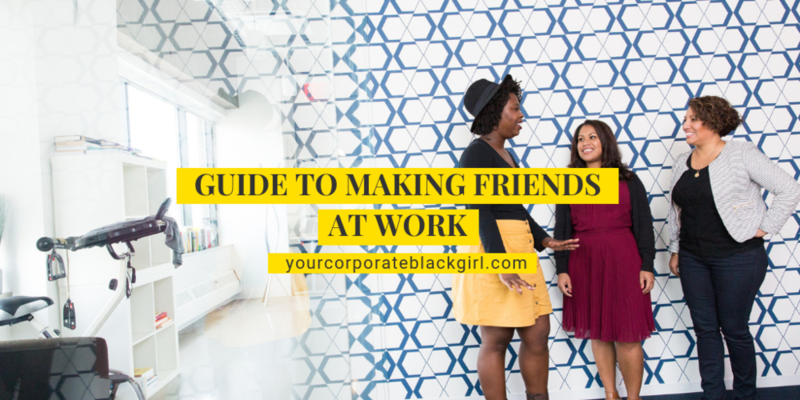 Use these tips as reminders when building friendships at work. This guide will help you protect yourself from drama and hurt in the workplace as well as learn how to not only identify but be a great friend. Whether you’re new to the team or welcoming a new colleague to your department don't feel pressured to become BFFs by the lunch break. As with any relationships, you want to take the time to get to know your peers and decide if that person is someone you want to include in your life. The beginning stages of befriending a person are the most crucial. Their first impression of you and vice versa is a prominent perception that will only be proven or disproven over time. Be sure to welcome with a warm and genuine smile and ask them questions about themselves. People love talking about themselves even when it’s a simple conversation about why they work here, what they enjoy outside of work or their favorite lunch spot in the area and why. A small conversation like this is enough to find some possible commonalities and just enough to not make them uncomfortable. Once you identify someone you’d like to befriend, shoot your shot! The best way to do this is to acknowledge them. When you both are free, pull them to the side and complement their efforts, ask if they need assistance or ask for a lunch buddy to try the restaurant they like, one neither of you have been to or even sit in the breakroom together and talk. These are subtle ways to deepen the relationship and stay professional. The key here is to not rush it. Don’t share gossip, don’t talk bad on the company or team in any way and don’t pry into or over share your personal lives. This tip is to protect yourself from any conflict, drama or negativity. Be your (professional) self in every way possible. No true friendship will grow if you’re strictly professional and lacking personality, empathy, and relatability. That relationship will climax as respectful-coworkers and although that’s okay, that’s not the point of this piece. On the other hand, being your complete self can open the doors to vulnerability and potential disappointment if trust is broken or words are twisted behind your back. That is why it’s best to be your (professional) self. While maintaining company protocol and professional etiquette, bring your humor, passions, mannerisms, and personality to your new friend. An unfortunate truth that I was also taught by my mother, is to trust no one. It’s nothing personal but at the end of the day you’re at work for 3-ish reasons, remember? If the relationships grow to where you are meeting up after work, talking and texting or sharing social media, you never want to completely let your guard down. While remembering this, you also don't have to state it. Once you do, the relationship may turn, and the new friend may no longer desire to pursue. This is a tip you want to remember for a while into the relationship. Even if this person becomes a great friend, you only want to be your (professional) self. Once either of you leaves the same company, feel free to let that guard down a little more! This tip is to be determined by situation and circumstance. To be blunt: don’t be a hater and don’t block your blessings. Living by both ideas will save you from a lot of conflict with your colleagues and potential friends in the workplace. Let’s start with not being a hater. There are times that will arise where you may begin to feel jealousy or envy. You might believe that someone wasn’t deserving of a reward or promotion they received. What’s important is accepting that these human emotions are natural and have existed in humanity long before you and will appear long after you leave this planet. They key is not acting on them in a harmful way and damaging your friendships or even your own career. Accept your feelings and discuss them with a trustworthy person like a parent, therapist, mentor, etc. Remember that timing is individual, and everyone's path is different. Never assume, never take things personally and try to genuinely be supportive of your colleagues and work friends. A great book for dealing with these feelings in the workplace: The Four Agreements by Don Miguel Ruiz. On the other hand, you must know when to support yourself. Don’t become a doormat and risk your coworkers taking advantage of you. Your talents and effort are your duty to display. It’s great to support your work friends but never expect them to do the same in return. When you cover your own tail and work with good intention, you will never have to be disappointed if the support isn't reciprocated in the way that you’d like. No matter what you’re “labeled as” always remember that your work is what speaks for you. When you work hard, try your best and push yourself it won’t matter if you’re labeled as unfriendly or unproductive. You know you and you accomplish your 3-ish goals. Use these tips to practice being both friendly and productive and enjoy where you work with your new friends! Happy #WomensHistoryMonth! Stay in formation, Ladies! Jasmine is a Social Media Manager in Dayton, Ohio. She has experience in digital marketing and public relations. Jasmine has been in the corporate world since May 2018. She spends a lot of her time working, editing and organizing. She finds a lot of joy in tweeting, snacking, and Beyonce! Her goal is to change lives and help creatives have the ability to touch the world.